Small businesses across Staffordshire are being encouraged to be more vigilant in the ongoing fight against Cyber security. The free training, delivered by Staffordshire Police’s Crime Prevention Design Advisor, Kate Dempsey and Staffordshire’s Digital Police Community Support Officer Matthew Hough-Clewes, gives Staffordshire businesses the chance to get cyber savvy and stay one step ahead of online fraudsters, with designated workplace champions. The partnership of local business and public sector organisations is chaired by Deputy Staffordshire Commissioner: "I know that businesses across the area are passionate about eradicating this kind of crime but awareness is the key to tackling it. "No matter how big or small, all businesses need to be aware of this crime and the role they play. "The University will help ensure businesses gain this free training and increase online fraud awareness." 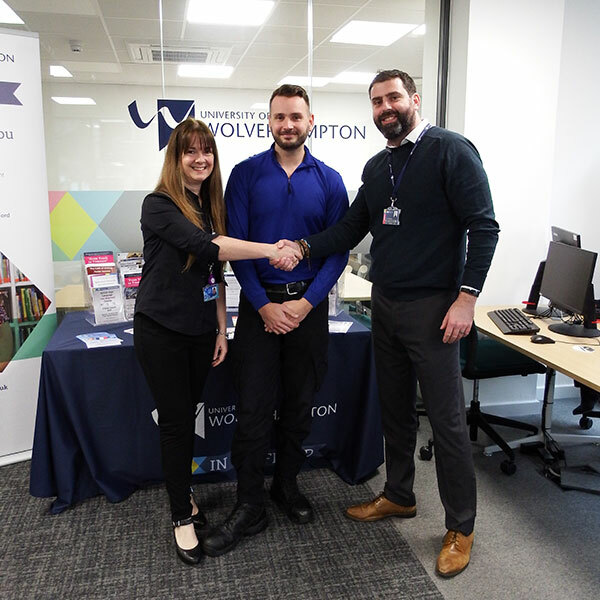 University of Wolverhampton in Stafford Centre Co-ordinator, Trevor Humphreys said: "We are proud to be working on this important project. "We all have to become smarter if we’re going to reduce the impact of this kind of crime and this free training will enable businesses to stay ahead of the fraudsters." Fraudsters are increasingly targeting businesses large and small. Last year, online fraud and cyber crime was estimated to have cost the economy £27 billion a year with £5.8 million loses in Staffordshire in the past 3 months. PIC CAPTION: UWIS Centre Co-ordinator Trevor Humphreys with trainers Matthew Hough Clowes and Kate Dempsey.